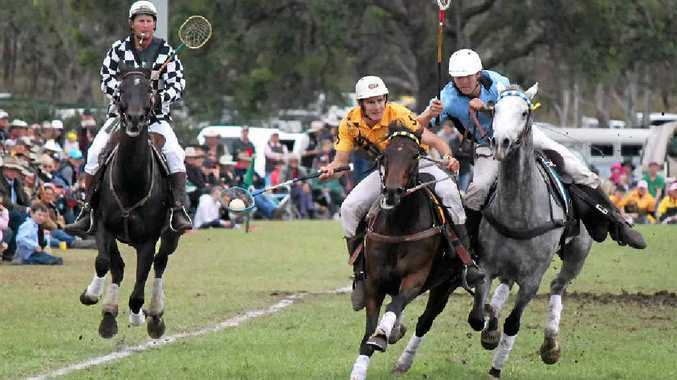 DESPITE one seven-goal chukka by Western Australia No.1 Robert Sibley, New South Wales won the open men's final in the Barastoc Polocrosse Nationals at Morgan Park yesterday. New South Wales led 4-2 early and then 18-11 at the end of the fifth chukka before the outstanding combination of Jared Martin and Sibley reduced the lead to 20-18. Hayden Turnbull and Will Weston were prominent for New South Wales late in the game as the defending champions gradually took control. New South Wales captain Greg Davidge said his side went into the game quietly confident. "We felt we could get on top in the two extra chukkas," Davidge said. "It was a great team effort; our third victory in succession." In the women's competition, New South Wales was 5-1 down early before winning 20-15. The victory prevented Western Australia from making it three victories in succession. New South Wales captain Sandra Weston said the start was scary. "We're fighters and we were hungry," she said. "Our girls have had a few losses in past nationals. We learn from our mistakes and only want to go forward from here. "I expect Western Australia to come back with a vengeance next time." In the third last final yesterday, New South Wales won 32-18 against Queensland in the men's under-21 grade. The Queensland team was coached by Warwick player Mark O'Leary and included Southern Downs players Chris Hall and Tom Cobon. The Queenslanders won three of their four round games. The only round loss was 22-14 to New South Wales on Friday. Western Australia performed strongly all week and had cause for celebration on Saturday night with a 23-17 win against New South Wales in the senior mixed competition. The Daily News Challenge Cup was another victory for New South Wales - 30-16 against the South Australian No.1 team. Queensland won the under-21 mixed competition. Overall Maroons manager Wayne Austin said the U21 mixed victory was on top of a win at Ballarat two years ago. "These are our first back-to-back wins at the nationals in this grade," Austin said. "We won under 12s and performed better overall than at Ballarat. We will win a few more next time."